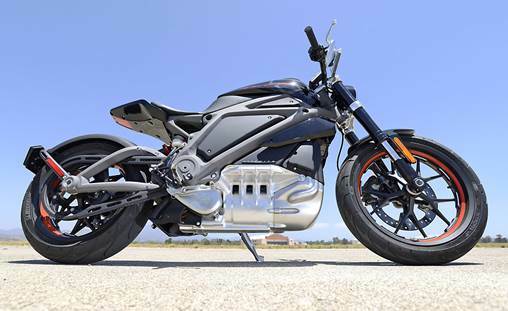 “The (Livewire) debut marks a dramatic departure for the 110-year-old motorcycle company, which is hailed or hated for its powerful engines, loud exhaust pipes and brash rebel attitude. … It accelerates like a ballistic missile and sounds like a jet engine turbine. As LiveWire designer Kirk Rasmussen said, "People get on this thinking 'golf cart,' but they get off it thinking 'rocket ship. "” …That should appeal to younger male riders in particular, while the electric aspect should appeal to younger riders of both genders, who tend to be more sensitive to enviromental (sic) matters. The company was one of Greenpeace's Do Not Buys for a long period of time. Yet in the past year Greenpeace has been applauding Apple for eliminating toxic materials, materials in conflict areas, and setting a bar in 2014 for climate leadership. The company is now using 100% renewable energy at all data centers, which is setting the bar in the tech space. These solutions are most remarkable when you realize they are happening independently, across industries, across companies, even when the innovations appear to undercut a successful, established brand, as in the case of Harley-Davidson.From companies to individuals to institutions, everyone seems to be a part of the distributed solution. Conservative government and business leaders advocate climate change action in a just released report “Risky Business.” Millennials are moving away from private car ownership. And Harleys may soon sound like jet engines…or nothing at all. This month, the Orca Whale was added to the constituencies fighting for the West Coast’s beloved but increasingly degraded Chinook Salmon population. This after 60 people spent 4 years developing a plan to protect the Chinook in Puget Sound. The compelling goal, “to lead the region toward a legacy of healthy, harvestable salmon and improved water quality for future generations,” brought together citizens and scientists; community, business, and environmental groups; and local elected officials and public agency staff. And, just two months ago, their science-based plan was ratified by 24 local governments. Now the plan must be re-formulated. It turns out that the Orca, an endangered species itself, requires enormous quantities of Chinook salmon to survive. Far more than previously estimated when the agreements were conceived. NOAA (National Oceanic and Atmospheric Administration) has asked Washington state and Indian tribes that fish in the area to submit a two-year plan for insuring that the endangered whales have enough salmon to sustain themselves. The backlash has already started. "You can't bring back Orcas just on the backs of fishermen," Joel Kawahara, who fishes commercially in Washington and Alaska, told UPI. "What about improving habitat? What about the effects of the dams on the Columbia River?" The constituents who worked so long and so hard might have to come together again to deal with NOAA’s new requirements. What strikes me about this issue is that, by injecting a new environmental parameter, the Orcas are adding the pressure needed for a true breakthrough— a new paradigm modeled on environmental processes rather than capitalist structure. Think of the progress we’ve made in less than 25 years to balance the needs of man and nature. First, US business, with the help and prodding of the insurance industry, figured out how to integrate environmental risk into business projections. This was the first successful monetization of the cost of bad behavior toward the environment, but it relied completely on the capitalist model, on boiling everything to down to its economic value. Then business learned to negotiate with opposing groups, even radical activists like Greenpeace, and still make a profit. To the monetary value of good environmental practices was added the value of relationships, which both diffuse activists and protect or even grow brand loyalty with those customers who are environmentalists themselves. Now the Orca in Puget Sound add another twist: environmental preservation requires not just a broad cross-sector effort but also an on-going effort. Because the physical world is so interdependent and always changing, an environmental agreement or “fix” is never permanent. Instead business must create structures for a permanent relationship with nature, just as it has with human impediments; structures that insure constant interaction. So how does the concerned citizen/consumer/investor judge which companies are most prepared to manage the on-going environmental challenge? The attributes measured by CSRHUB are the best way to look at a company’s current behavior. But for those looking to predict the future, it may be most useful to look for evidence of organizational structures for on-going collective action on the environment. Look for companies that have teams in place for permanent environmental interaction, councils on which senior executives participate led by skilled negotiators. Once common, these councils are disappearing as the economic malaise continues. Use your consumer and investor power to force companies to fund these councils. They establish the importance of relationships — with humans and nature — to succeeding in business. And we save the whales too. This post is the latest in Crowds of Ratings, a Triple Pundit guest series about the CSR ratings field. There are more than 1.5 million US organizations—and many more overseas—that have put addressing a social issue or need above the goal of making money. More than 2.3 million people work (again, the US figure) in these “not for profit” (NFP) organizations. Hundreds of thousands more work for NGOs (non-governmental organizations) such as universities and hospitals. These dedicated altruists help the poor and sick, lobby for legislation, protest, persuade, and discuss important social issues. They also contribute a ton of useful information on corporate social responsibility (CSR). NFP groups have the patience and enthusiasm necessary to track a company’s behavior over a long period of time, make lists of companies who do and do not support their cause, and mount public campaigns aimed at changing both consumer perception of a company’s brand and company management and employee awareness of how their company is behaving. We have found these sources most useful for understanding specific, controversial issues (what we call “special issues”). For instance, should companies test products on animals? People for the Ethical Treatment of Animals (better known as PETA) feel they generally should not. They maintain a list on their Web site of companies who do animal testing and encourage others to refer to this data. A dedicated animal-loving researcher named Alex Poulos keeps his own list of “good” (no testing) and “bad” (testing) companies on a site called “Vida Compassion” or “Alex’s List.” A third group called Understanding Animal Research offers a list of companies who have published statements on their internal policies and regulations on animal testing. Their view is that when performed responsibly, animal testing contributes to safer products and better human health. Another list comes from the American Anti-Vivisection Society (AAVS)—which now has set up a “Leaping Bunny” certification program. If you areinterested in the animal testing issue, you should probably explore the information on these sites and many others listed here. You can also cross check the data on each company these sites mention, using two of our SRI sources—Asset4 and IW Financial. NFP sources give us information on things like mercury in fish (Oceana), involvement in Burma (The Burma Campaign and Global Union Burma), and a list of who is in the coal industry (Coal Mining Engineer’s List). We’ve integrated many of these sources into our CSRHUB rating project—but we’d like to have more. What holds us back? Many NFPs do not target corporate behavior. For instance, of the six current “Take Action” suggestions from the Natural Resources Defense Council (NRDC), only one involves company behavior. Many NFPs believe they can most effectively change corporate behavior via private interactions. Corporations sponsor a particular NFP program, adjust to a request from an NFP to change a policy, or respond directly to a letter or position. For instance, The Nature Conservancy does not share its corporate discussions with outsiders like us. Many NFPs do one-time studies. For instance, Greenpeace did a wonderful study on the effects of cattle breeders on the Amazon. But, our system needs long-term, broad-based data—so that we can track over time and across many industries and countries. By its nature, the data from NFPs is not independently reviewed and verified. We tend to favor data that can be verified or confirmed. Many NFPs have become justly famous for the quality of their CSR reporting. For instance, Wood Turner’s ClimateCounts has been publishing corporate climate change Scorecards since 2007. His small group of analysts assesses and publicizes the climate performance of more than 140 companies across 22 different areas. We all benefit from this kind of selfless service to our community.